Home» » TS HRA PRC No. 27 House Rent Allowance– Revision of Pay Scales,2015 Order. TS HRA PRC No. 27 House Rent Allowance– Revision of Pay Scales,2015 Order. TS HRA PRC No. 27 House Rent Allowance– Revision of Pay Scales,2015 Recomendations Order. ALLOWANCES– House Rent Allowance– Revision of Pay Scales,2015 Recomendations of the Tenth Pay Revision Commission Accepted – Orders. 1. G.O.Ms.No.59, Finance (PC.I) Department, dated 11-04-2011. 2. G.O.Ms.No.95, G.A. (Spl.A)Department, dated 28.2.2013. 3. G.O.Ms.No.25, Finance (HRM.IV) Department, dated18-03-2015. (ii) The existing ceiling of Rs.12,000/- be enhanced to Rs.20,000/- per moonth for the areas covered by Greater Hyderabad Municipal Corporation. (iii) For other places where ceiling is Rs.8,000/-, the same be enhanced to Rs.15,000/- per month. (iv) The existing rules wiith regard to the payment of HRA at the rates applicable to the places located with in the periphery of 8 KMs for the towns / cities concerned be continued. (v) The census figures of 2011 have been takeninto consideration for classification under different categories for purpose of drawalof HRA. 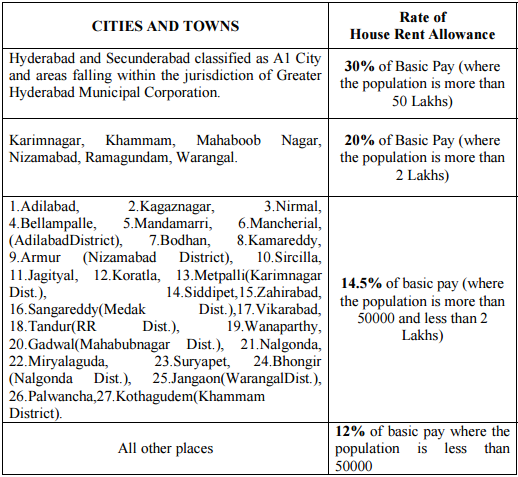 (1) The existing House Rent Allowanceceiling of Rs.12,000/- shall be enhanced to Rs.20,000/- per month in respect of employees working in the offices in the limits of Greater Hyderabad Municipal Corporation. (2) For other places, the House Rent Allowance ceiling of Rs.8,000/- shall be enhanced to Rs.15,000/- per month. Only decennial census figures shall be taken into consideration for classificationunder different categories for the purpose of drawal of House Rent Allowance. Separate orders will be issued in respect of officers of the HigherJudicial Services and the State Judicial Services. These orders shall come into force with effect from 2nd June, 2014.The revised rates of House Rent Allowance shall be paid in cash along with the salary in the Revised Pay Scales, 2015 from the month of March, 2015 payable in the month of April, 2015.As regards the arrears from 02-06-2014 to 28-02-2015, orders will be issued separately. Necessary amendments to the relevant rules [Public Employment (House Rent Allowance) Rules, 1988] shall be issued separately. This G.O. can be accessed at the addresses, http://goir.telangana.gov.inand http://finance.telangana.gov.in. Get Download G.O NO:27 Click Here.